^ Ariel, Avraham; Berger, Nora Ariel (2005). 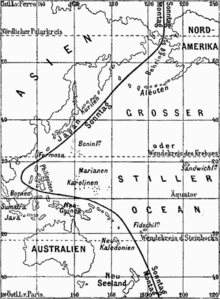 Plotting the Globe: Stories of Meridians, Parallels, and the International Date Line. Greenwood Press. pp. 149. ISBN 0275988953. http://books.google.com/books?id=2xTJt3b3SHUC&pg=PP1#PRA1-PA149,M1.